10 Things to See in Saigon. Part 2. 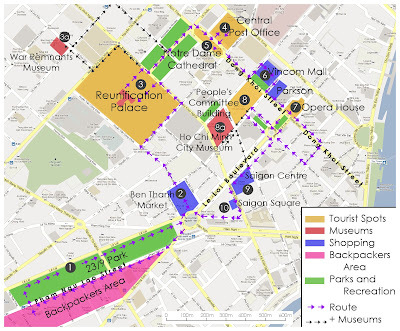 CityTour: 10 Things to See in Saigon. Part 1. 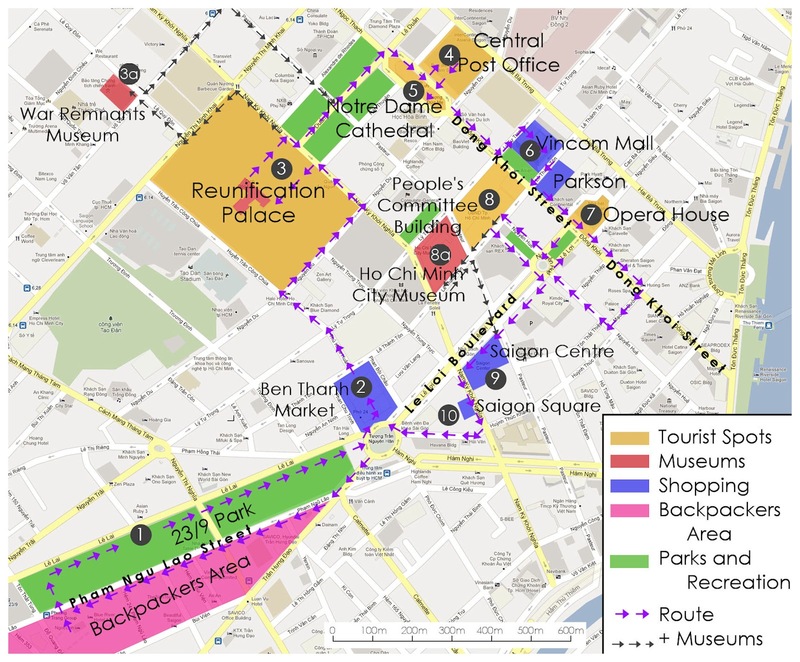 Map of Saigon's District 1. Click to enlarge. There are only a few shopping malls in Saigon and the one who stands out is the Vincom Center. The first 6 floors of this building is the shopping mall. You’ll find a lot of luxury fashion brands, a big arcade and good restaurants. It also has the best supermarket in town. We bought a lot of our “food pasalubong” here. One block south of Vincom Mall is the Saigon Opera House. Just like the PostOffice, it looks like a normal Colonial Building but when you look at the details of the building, you learn to appreciate it. There are also a lot of interesting things to see when you’re standing in front of the Opera House. One is the Hotel Continental on the right, which blends in with the architecture of the nearby buildings. In front is a small park and on the left is a picturesque view of Dong Khoi street. After touring most of the sites in Dong Khoi Street, we went for a break in L’Usine, a charming café and shop on the second floor of a building near The Opera House. I love this café so much, perhaps the best I went to on my Southeast Asian trip, so this one deserves a post of its own. It was dark when we left L’Usine. We walked a few more blocks on Dong Khoi Street before we decided to head to the People’s Committee Building. But before we got there, we saw the Saigon Opera House on the other side of the park and it looks spectacular at night. The People’s Committee Building or the City Hall is another French Colonial building in Saigon. This, I think, is the icing in the cake for it has the most intricate details and is the most fascinating building in town. Sadly, it’s not open to the public, but hey, I’m content just looking at it from the outside. From the City Hall, we decided to do our sightseeing in the direction of our hotel. So we turn on to Le Loi Street. While walking on the street, we passed by Saigon Square. My sister is looking for a replacement for her North Face bag so we decided to check out the stuffs in the mall. Most of the things in Saigon Square are clothes and bags, which you can also find in Ben Thanh Market. Again, you need to bargain for the best prices. If you can’t take the heat in Ben Thanh Market, then Saigon Square is your best bet, it has A/C! A block away from Saigon Square is Ben Thanh Market. At 5pm, as the market closes, the 2 roads beside Ben Thanh Market come alive, as the Night Market. There are only 2 rows of stalls on each road so there’s not much to see but it’s still a good way to see how life goes on in the city. There’s also a lot of food along the streets. From noodles to colored sticky rice (I don’t what they’re called), dumplings and barbecues. There are also a lot of fruit stands that sell jackfruit, dragonfruit, durian, lychees, mangosteen, makopa, pineapple, papaya and more. After the Night Market, we headed back to our hostel to rest. It was a fulfilling and gratifying Day 1, having seen all of the places we wanted to go, and covering more than 20 kilometers just by walking. After our taxi experience, I felt a lot of doubt and dislike for Saigon. But after our self-guided city tour, I feel a certain kind of love for the city and the locals. While walking in between our destinations, the locals just keep on giving us genuine big smiles and a certain welcoming look that I haven’t seen in other countries before. I know a creepy and a disturbing smile when I see one, but in Saigon, the worst look you’ll see are inquiring and curious looks. Aside from the smiles, I also like the fact that the locals don’t badger you when you’re walking in the street. They don’t insist and pester you on motos and tuktuk rides. When you say ‘No’, they stop.